Character: Considered a true ale is brewed using traditional brewing methods for a unique flavor profile. Here is a beer I accidentally came across. When I took my trip to The Texas Frightmare Weekend in Dallas, TX, we were a bit unprepared, as we did not pack any food, and since we were staying at the same hotel as the convention, it was dumb for us to leave the hotel, which was in their airport, just to go get drive thru somewhere. So we went to a local grocery store called Tom Thumb and picked up some sandwich supplies. As I always do, I ventured to the beer isle to see if there was anything worth picking up. Of course I ran across a few unique beers I had never seen before, including a six pack of Roscoe’s Hop House Pale Ale. I did investigate the carton thoroughly to see if this was yet another “Big 3” hiding behind a craft beer label. I saw nothing that indicated that, so I bought this. I did however research Roscoe’s Hop House which I expected it to be a brewpub or something. It actually looks like Roscoe’s is a brand of beer brewed by The Winery Exchange in California. It seems like this place is a private brand beverage company that sources beer, wine, and spirits to different regions worldwide. There is a list of beer brands on their site that they brew which includes such names as Barrel Trolley, El Loco, Dieselpunk, Four in Hand, and Big Flats 1901 (Yes that one cheap beer sold at Walgreens), among others. I used my Texas Frightmare Weekend pint glass for this one, since I got this beer while there! This beer poured a hazy golden orange color with a thin white bubbly head, which hung around a bit, but vanished about half way. There was some lacing, but not much left on glass. I picked up a citrus like, piny aroma, played well by the hops in this beer. There is a slight malty smell in the background, but for me, it is mostly hops I pick up, but it’s not overpowering or very strong. The overall aroma is a bit thin, and not too heavy on the nose. Good use of ingredients to accomplish this balanced aroma of the hops and grains. The taste is just like the aroma. Nothing overpowering, but rather well balanced with the flavors of hops, and the malts. The hop flavor of citrus and pine are upfront, followed again by a bread-like malt flavor. Roscoe’s Hop House Pale Ale has a nice medium body. Not making you feel full after drinking a bottle. The mouthfeel is slick, with a nice bite at the end of the drink. Overall, I will say this beer is easy to drink, and since it’s not overwhelmed with odd aromas or flavors, it is enjoyable. Did it blow me away, and make me want to buy a year supply of it? No, not really, but it was worth giving it a shot at least. The Metal Connection was quite funny how I came up with my choice. 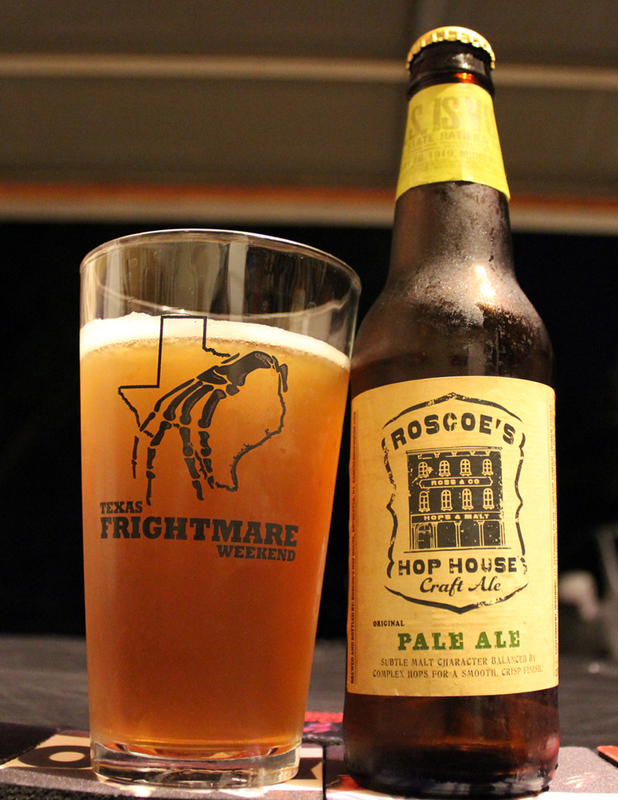 When I would talk about this beer, my Metal/Horror mind would always say Roscoe’s “Chop” House, instead of Hop House. I immediately thought of this classic Obituary song, “Chopped in Half” from their 1990 album, Cause of Death. Now, finding a Roscoe’s Chop House beer might not be an easy task, but at least watch the video posted of one of the founding bands of the Death Metal genre playing this classic song live. Enjoy!